Product Description: Soothing formula helps relieve itching, flaking and dry scalp. Griffin Remedy Scalp Therapy Shampoo is formulated with Tea Tree Oil and Organic Aloe Vera Gel, which soothes the scalp while moisturizing and nourishing hair. Aloe Vera contains natural anti-inflamatory compounds that help relieve irritation, itching and flaking. Ingredients: Purified Water, Decyl Glucoside, Coco Betaine, Soy Protein, Coconut Glycerine, Cellulose Gum, Citric Acid, Sodium Benzoate, Vitamin B Complex, Peppermint Oil, Organic Aloe Vera Gel, Tea Tree Oil, Organic Jojoba Oil. Suggested Use: Apply to wet hair, lather then rinse. Repeat. 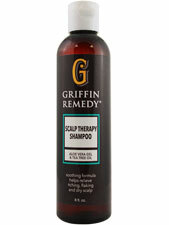 Best to follow with Griffin Remedy Scalp Therapy Conditioner.